Given the recent headlines covering efforts to improve the plight of African American men and boys, I invited Austin to meet with the Center for American Progress Leadership Institute. Over the past 30 years, he’s worked in a variety of venues, touching on education, social policy, youth development, cultural theory, philanthropy, and religion—nearly all of it aimed at improving the status and civic participation of black boys and men in American society. When I invited him to meet with our budding public policy leaders, I knew he would share his scholarship and experience. But I wasn’t expecting him to be as frank about the differences between the old civil rights establishment and the new, emerging generation of leaders. “I’m proud of the civil rights movement,” he said. “They’re building a museum for it and that’s great. They should put all the old civil rights leaders and tactics in that museum and the every young person should go see it. Then, they should do their own thing, in their own ways.” That was his preamble to whipping out the smartphone. “I’m not too old to learn to use this,” he said, chuckling at himself. Since then, he’s risen upward through stints as a teaching sociologist, foundation executive, college administrator, speechwriter, author, and policy consultant in education and the humanities. Notably, he worked as a program director for the W.K. Kellogg Foundation during most of the 1990s. In this role, he founded and directed the African American Men and Boys Initiative, a $15 million effort to improve the lives of African American men and boys. Under Austin’s leadership, the program funded 32 projects across the nation and could be viewed as a precursor to President Barack Obama’s “My Brother’s Keeper” initiative. Austin’s latest project is an unfinished, book-length manuscript that explores the challenge of citizenship. He notes that many Americans increasingly live in isolated communities and don’t interact very much with people outside their tribe. Ironically, this is happening at the same time as social media and other emerging technologies make it possible for people to become more connected. Yet, as Austin noted, our civic life and our public politics are starkly polarized. This has serious implications. Austin said the same black men and boys that people in their families and immediate communities recognize as fathers and sons are often viewed by the police as “other worldly” and “demonic.” If such negative public perceptions are widespread enough, it permits the police to respond with deadly force and politically powerful people in those communities to support them. While researching this project, Austin wondered what it would take for these pockets of people to come together and find common ties with their fellow citizens who often hail from far-flung native lands and cling to varied backgrounds. Part of his research into this area led him on a journey from college campus to street protests. Austin described the 21st century model of social activism as “pop-up leadership” in which people communicate with their smartphones and organize with speed and intensity that was unknown in their grandparents’ day. “They can message each other to say that something is going to pop up at such and such a place. I’m watching a group of young people on college campuses and in troubled communities interacting with each other on Twitter and Facebook,” he said. To be perfectly honest, I never expected to hear a self-described “old head” from the ‘60s praise the new-age ways of young Americans. Austin is from the generation of Freedom Riders and church basement organizing in which it took weeks or months of preparation to mount movements, including, say, the 1960 lunch-counter sit-in at Woolworth’s in Greensboro, North Carolina. 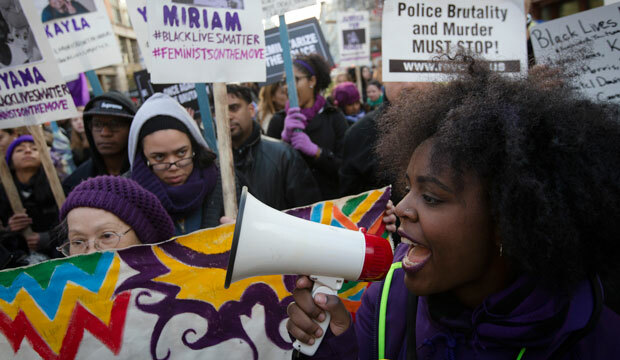 That’s a far cry from the seemingly spur-of-the-moment tactics employed by young street activists at the forefront of the protests over the deaths of Trayvon Martin in Florida, Michael Brown in Missouri, and Eric Garner in New York. Indeed, I expected Austin to reminisce about the good old days of marching on Washington. At the very least, I thought he might echo Oprah Winfrey, who created something of a social media smackdown when she complained earlier this month in a People magazine interview that the social-media-directed protest movement was leaderless. *Correction, January 26, 2014: This column has been corrected to reflect that Bobby Austin is 70 years old and that he was the first black full-time faculty member in the undergraduate college at Georgetown University.